This page provides an overview of basic page features and navigation aids to assist you in locating the information that interests you most. On some pages you may have to be a registered user and be logged in as that registered user to see some data or use some features. If you encounter any errors or would like to make suggestions, the procedures are enumerated below. If you need help on a topic not covered in this section, please let us know. CarrFamilyTree presents graphical displays of family group sheets, documents, display charts, etc. This Help section will introduce you to the main templates. The bold underlined blue links on this page will open a second window (or tab); you can follow the steps in the new window/tab while referencing the steps here. In either case, the following link opens a new window (or tab) to the Home Page. Features of that page can be seen and the window/tab can also be used to explore the features discussed below. On the home page you will see a Search box on the left margin and links to various topical sections. Login - Login to start your session. The same icon can be used to logout. 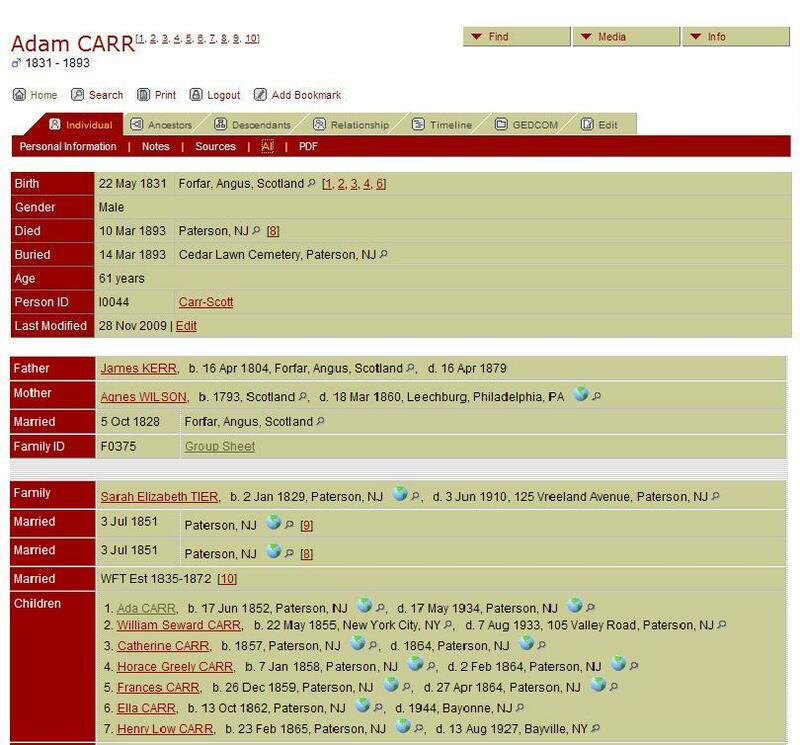 Find, Media, and Info are three drop down menus found on the right-hand side of the main header bar under Carr Family Tree. These can be used to quickly access any area of the site. If you hover the cursor (not click) you will see drop-downs that give you up to options to navigate this site. Individual Page, the header of which you see below. Spouse and Children (if any). Selected Person's Family Group sheet (spouse and children, with the individual as a parent). Below the family section you will see an event map showing the location of the main events in the life of the individual. By default, the event map is hidden; by clicking the map image, the map will be displayed. Depending upon the proximity of one event to another you may not see all pins; some pins may be overlaid by the pin of a later event at the same location. The legend to the right of the map will detail each event. Click on an event number pin to open the map in a new window. If you are using FireFox, you can right click and open in a new tab rather than a new window. Click on the plus (+) to zoom in on the map and on the minus (-) to zoom out, or use the slider to control the zoom. If the Google Map server returns a message that no map is available at that zoom level, then zoom back out to get the map to display. Click on the Map button to view the map as a simple raod map picture. Click on the Satellite button to view the map as a satellite picture with names. Click on the Hybrid button to view the map as a satellite picture with geographic names. On the map in the separate window, you can get driving directions to or from this location if you have downloaded and installed the application on your desktop. To download the Google Earth application to your desktop, click on the Google Earth icon on the bottom of the map legend. On the Individual, Ancestors and Descendants pages you have the option to create a PDF-formatted report with the information you are viewing. To make use of this option you will need to have Adobe Reader installed on your computer. If you don't have Adobe Reader installed, it can be downloaded without charge (freeware) by clicking this link. Click on " Ancestors" and you will find a dynamic chart. The default view is the "Standard" view (4 generations). (Note that each generation is shown in a slightly different shade, getting progressively lighter with each older generation.) Clicking on any of the names on the chart will take you to the individual sheet for that person. Notice that there are small red arrows beneath some of the boxes. If you hover your cursor over the arrow (not click!) a drop-down list for that person will open. You can click on a name in that sheet to take you to their individual sheet. Clicking on any	 icon will show the next generation above ancestors); clicking on the icon will show the ancestry starting from the next generation below. Wherever you see the pedigree icon , you can click it to show the ancestry of that individual. Also note that in the red bar just above the chart, you can specify the number of generations to display (beware that the page will get increasingly wider and longer, requiring more scrolling, as you increase the number of generations). In the red bar there are a number of other Ancestor chart views available by clicking on Compact, Box, Text, Ahnentafel, or Media. The latter displays both lines of parentage for any individual -- and lists that person's grand-parents, great-grandparents, and so on -- as far back as is known, based on the number of generations selected for the display. The icon that may be shown alongside a name in the Media display means that at least one photo, history, or other media item exists for that individual. The Ahnentafel chart (also known as an ascendants table - See Wikipedia article on Ahnentafel for details.) lists all the generations in tabular form, complete with all children and birth, marriage, death, and burial details if known. Descendants" tab gives you a listing of all descendants of this individual. The view below is provided using the Text tab. Other views are possible as are the number of generations selected. The default view is the "Text" list, also known as a "descendant drop chart." Note the small white boxes with a minus or plus sign in it. Clicking in that box will collapse or expand that branch of the tree. Also, once the descendants are displayed in this text format, you can show a graphic view of a specific branch of descendants from that ancestor by clicking the descendant icon next to the descendant whose chart you wish to display. That chart will include the siblings of each ancestor. Thus, the younger the individual, the greater the number of generations in the chart. The greater the number of siblings in a family, the wider the chart becomes. Try clicking on the other types of Descendant charts, listed on the red bar: Standard - a traditional "tree" with photos (where available), Compact - without photos, and Register - a list of generations in tabular form, similar to Ahnentafel. The " Relationships" tab allows you to generate a box chart to show the relationship between this individual and any other person in your tree. Just click on the "Find" button under "Person 2" and search for "Louis Drury Carr" (remember, last name on top). Select 'Louis Drury Carr' (ID-I0012) and click "Calculate"
The "Timeline" tab allows you to view a list of important (and some not-so-important) events that occurred during his lifetime. Hovering over the timeline with your cursor will reveal that individual's personal events (birth, marriage, births of children, death, etc.). Timelines for up to four other people can be added to the page to show timeline relationships between the primary person and the others. You can also populate a timeline by finding any 2-4 individuals manually and thereby compare them across the ages. This offers a perspective of world events during the lives of our ancestors. The "Suggest"tab allows you to make suggestions. The information in the suggestion will automatically be appended to the identity of the individual you referenced so that we can evaluate the suggestion and add it to the database as appropriate. A. "Surnames" will give you the master listing of surnames in the database and allow you to specify a surname, which in turn will list people to choose from. 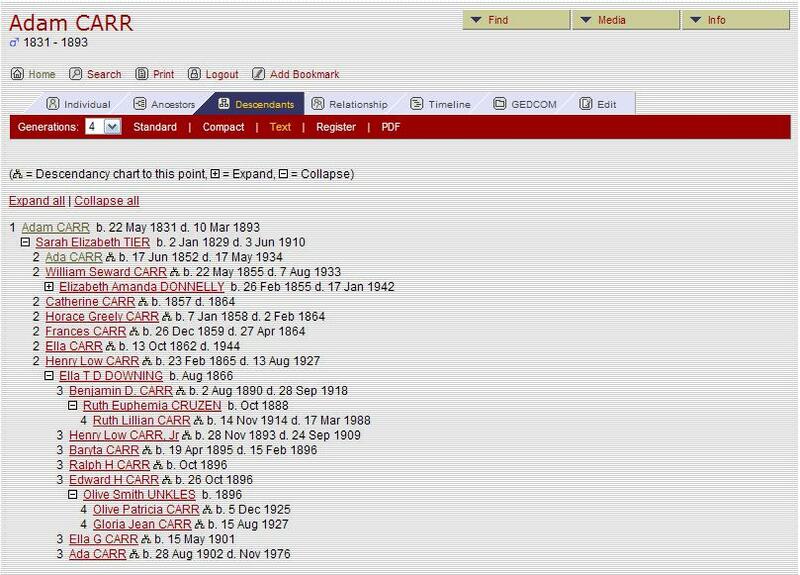 Click on "show all surnames" to get an alphabetical listing of all surnames in the database. B. If you know who you are looking for, then you are already halfway there! Just use the Search box on the right side of the home page (surname on top! ), and you will be shown all the records in the database that match your request. If you need to be more specific in who or what you are looking for, use the "Advanced Search" feature on the home page or by clicking on the search icon in the upper left hand corner of every page. There, you can specify several different criteria to search against, including birth and death information as well as spousal information. This is how to search for a woman when you know only her married name (use the "Spouse's Last Name" field). You can even search by event or place. Since the master copy of our database is maintained off-line in another file, users cannot directly edit information. As described above, the "Suggest" tab permits submission of additions, corrections, updates, comments or any other information about a specific individual or family record. Your submission will automatically reflect the identity of the individual or family being reference in the submission. Your suggestion will be added to the database if appropriate. If you wish to offer or ask something of a general nature, not related to a specific individual or family, then use the 'Contact Us' link in the 'Find' drop-down menu. Photographs and other media can be linked to individual and family records. We have added some media already on the website and we have much more yet to modify for quick and clear presentation via the Internet. We would very much like to hear from you if you are able to provide photos or other media relevant to anyone in the database. Please let us know if you can offer content. There is much more functionality on the website, but this walk through should be a good intro to the system. Feel free to poke around; you can't break it. But if you find anything wrong, or page errors, please let us know so we can fix it. If you are a descendant or relative of anyone on this website, then don't forget to sign-up and then login (use link above left) to get the full benefits and to view information on living relatives in your branch of the tree!